These are boards that are great for beginners with versatile designs that work well in a variety of conditions including flat water and small waves. They have more speed and glide then surf sups and are stable with widths over 30+ inches wide. They are perfect for first time paddlers and come in a variety of different sizes, models & constructions to suit whatever you need. Inflatable SUP’s offer a convenient and compact alternative to hard boards that can easily be packed down to fit in a car and with a 3-piece travel paddle are perfect for travel abroad. Premium quality inflatable paddle boards are made with thermal welded seams and fused drop stitch laminates to offer the best durability and lightest weight. These are surf paddle boards to suit all levels of surfing ability from Entry Level, Intermediate, Advanced to World Championship Winning Pro’s. Includes shapes such as the Starboard Whopper & Avanti that excel in the small waves of Perth’s popular beaches as well as as in the larger surf at the reef breaks in the states north and south. Kids can typically get up and paddle on most SUP’s with models such as the Starboard Whopper & Starboard Drive popular with families. For those seeking the perfect SUP for their Kids there is a range of dedicated Kids stand up paddle boards with children’s specific shapes and features to maximize their experience on the water. SUP Foiling is stand up paddle boarding with a Hydrofoil. The experience is thrilling with pure silence and an effortless ride while floating clear of the bumps and chop of the water. Our range includes surf and downwind foils and boards from Starboard SUP, AK Surf and GO Foil for prone, towed & stand up paddle foiling. Race boards are the fastest shapes for any water condition. With planing hull boards for flat water, displacement hull boards for downwind racing and versatile all round race boards for choppy water and training. Proven race winning shapes from Starboard SUP that dominate racing year in year out. Performance surf and race designs for beginners to advanced and world championship winners in adjustable or fixed length with full carbon, glass and hybrid construction. Paddle parts, accessories and service for all the major brands including Starboard SUP, Naish, Quickblade, Kialoa, Blackfish, Aquaglide, Red Paddle Co, JP Australia. This range of handy items will maximize your experience on the water and make life easier off it with items to assist in use, transport & storage of your paddle board equipment. From Flying Objects, Creatures of Leisure, Ocean & Earth, Future Fins, FCS and other major brands. Stand Up Paddle Sports is a Stand Up Paddle Board specialist store and one of Australia’s biggest Starboard SUP specialists. Our Osborne Park Warehouse has over 200 boards from the leaders in SUP. 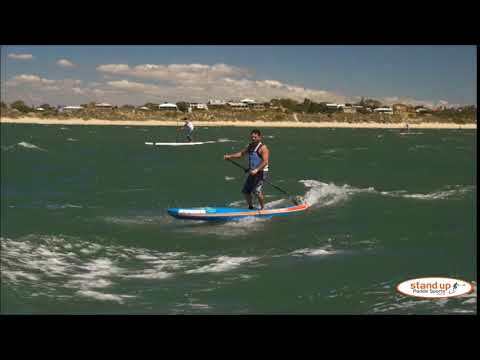 We have Perth’s largest range of Starboard SUP stand up paddle boards from the world’s best sup brand. We also have great value boards perfect for beginners and all skill levels. If you are looking for a good deal on a used SUP ask about our Ex-demo or trade second hands. To compliment your SUP and for the avid paddler we carry a range of quality board bags, paddles, tie down straps, repair kits, racks and other water sport accessories from the major brands at reasonable prices to suit your needs. We carry hard & inflatable paddle boards great for beginners and all skill levels. They are made for ocean and surf use while being well suited to Australian conditions. The boards are built to last with premium reinforcing and using the highest quality foam, resin and drop stitch materials. Durable & strong whilst light which increases board performance and makes them easier to paddle. They are also easier to carry, handle and put on the roof racks or in the car. These boards are great for catching small waves whilst capable on larger waves and also good on flat water. They include the famous models such as the Starboard Whopper, Drive and Element. These boards can be hired at our school on the Swan River at Crawley. Daily & Weekly rentals including Astro inflatable paddle boards that are ideal for travel are offered from the Osborne Park store. Perfect for exploring the water in places around Western Australia like Dunsborough, Exmouth or Point Walter. Our popular surf range includes the Hyper Nut and Pro models ridden by experienced stand up paddle surfers in big waves and world champions Australia’s Shakira Westdorp and Hawaii’s Zane ‘Inzane’ Schweizter to title success. Our Race boards inspire the designs of Starboard’s ground breaking touring boards and dominate racing on the world tour year after year. The Ace is the original, most successful and best displacement hull board. The Starboard Allstar is the most versatile race board for chop and down wind, and the Starboard Sprint is the fastest board on earth. They are the boards of choice for competitive paddlers trying to extract the most from their paddling technique and winners of World Champs, Australian National & WA State titles. Stand Up Paddle Sports stocks a wide range of value and premium Starboard SUP fixed shaft and adjustable paddles. On hand are over 50 different models including surf paddles, race paddles, travel paddles and entry level paddles. An experienced team of paddlers is available to explain the various designs and constructions, and will help you in selecting the perfect stand up paddle for your requirements. Our staff members will happily measure, cut and glue your fixed length shaft paddle at our onsite paddle workshop. For the right SUP advice just ask the experts at Stand Up Paddle Sports.